Some things to take note of concerning the TLM this week, May 29 - June 3. Monday, May 29 is Memorial Day. Remember our veterans! Immaculate Conception will offer a TLM at 8am. First Saturday at St Stephen will be at 8am, and the usual class afterwards will not be offered. This week only. The rest of the schedule remains the same. If reading this via email, consult the homepage of the blog for times. Thank you to the Friends who answered the request to inform us about other Masses for the Ascension Solemnity. Of course, in the Diocese of Cleveland, the Holy Day Obligation for the Feast of Our Lord's Ascension has been moved to Sunday, May 28, 2017. The traditional observation, 40 days after Easter, is Thursday, May 25, 2017, and Latin Masses will be offered for this pious observation. Bring a friend! Introduce someone to the Latin Mass. Oftentimes folks aren't available to come to Sunday Masses due to their commitments at their own parishes. But, when there are weekday evening High Masses, it is a great opportunity to reach out and invite a friend, neighbor, and coworker. Let's all resolve to do this! If you don't know already, the Cleveland Marathon is upon us again this Sunday, May 21, 2017. In the past, it has been a pain for St Stephen parishioners to access the parish for Holy Mass. St Stephen's website has important information for anyone planning to go there for Mass on Sunday. It appears that the Faithful will be accommodated in their efforts to reach the church and assist at Holy Mass. But we were told the passes would work last year, too. Didn't quite work out that way. After the notice was posted for the Mass celebrating Our Lady of Fatima, Cleveland TLM Friends received many emails asking for the time of the Mass. We apologize for that critical element being overlooked. Within minutes of being made aware, an update was posted at 10:15am yesterday. That should have been delivered to subscribers' email inboxes between 11am and 1pm. It was not. Hopefully this one has reached you. The Mass for Our Lady of Fatima is at 11:30am on Saturday May 13, 2017, at St Stephen. Full details are on the website. The time for the Mass for Our Lady of Fatima was not included in the previous post. Thanks to all of you who notified us of that. See below. 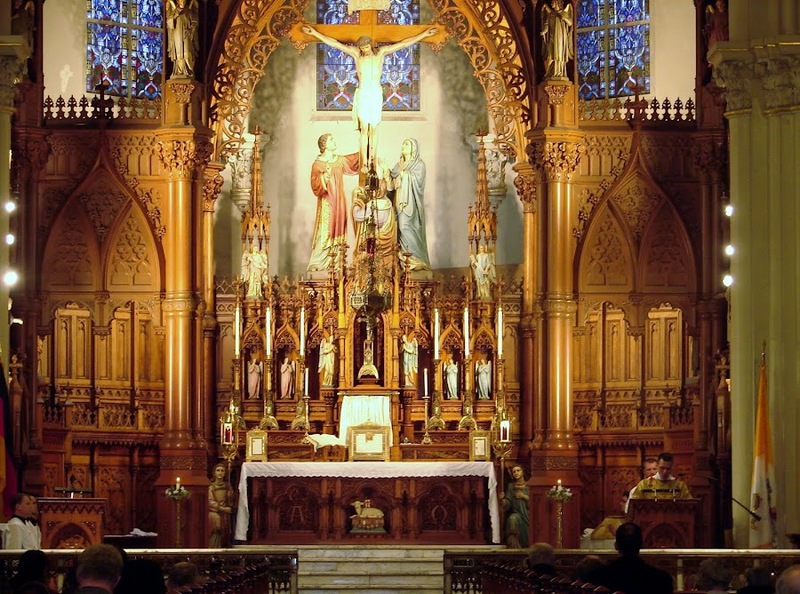 A Latin High Mass will be offered at St. Stephens on Saturday May 13, 2017, at 11:30am, in honor of the 100 year anniversary of the first apparition of Our Lady at Fatima. The Mass will be a Votive Mass for the Immaculate Heart of Mary. This will be followed by a Procession to the Garden (weather permitting) and a May Crowning wtih the profession of Marian Consecration at the end. Afterwards there will be a Potluck in the Club Room to celebrate this special feast for Our Lady! Please feel free to bring cut flowers to place before Our Lady for the May Crowning. And if you would like to stay and join in the potluck please bring some dish to share.